For the patients who are treated there, Van Mon Leprosy and Dermatology Hospital in northern Thai Binh Province is so more than just a hospital. Spread over four hectares on the banks of the Hong (Red) River in Vu Thu District’s Vu Van Commune, it not only offers medical examinations and treatment, but is also a place patients can call home. In the hospital they are supported and cared for. But more importantly they are in a place they can share their feelings with other patients and medical staff. The hospital was originally the Van Mon Facility for leprosy patients which opened in 1900. It was built in an isolated area on the banks of the river to avoid the disease infecting the community. The disease was caused by the bacillus Mycobacterium leprae and considered untreatable at the time. Most patients spent their whole life in the hospital due to the stigma. In 2003, the facility was upgraded into the Van Mon Leprosy and Dermatology Hospital. It is now part of Thai Binh Dermatology Hospital. Nguyen Di Ich has spent 62 years living in the hospital. Due to the disease, his legs and arms are deformed, making it impossible for him to move. Ich said he had been depressed from the day he learned he was a victim of leprosy in 1957. The disease was considered devastating and chronic. He sought treatment at the hospital in 1957, and is still there today. “Most of my life is associated with this place and the people working and living here. Doctors and nurses take care of me, help me with meals and sleeping. They are my family,” he said. Nguyen Thi Ngoc, another patient, said she decided to stay at the hospital after many years of trying to get treatment at other medical centres around the country. After 20 years living at the hospital, Ngoc said she was happy as doctors and nurses always were never too far away. Ngoc said although things had been changed and the hospital was no longer an isolated and scary place, discrimination and loneliness were unavoidable. 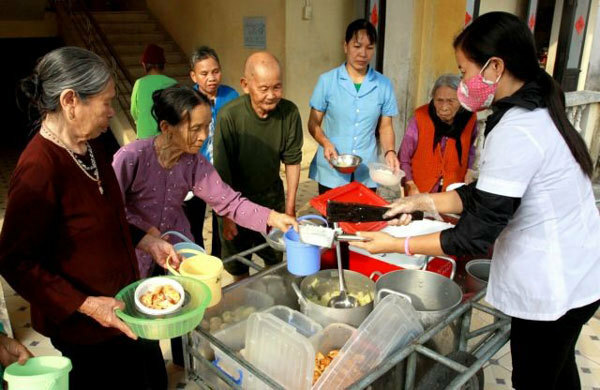 Nguyen Thi Nhai, who has worked as a nurse for nearly ten years, said each nurse took care of six or seven patients, mainly the elderly who could not look after themselves. She said despite the hard work, she was happy with her job as she could help ease pain and loneliness for the patients. Deputy director of Thai Binh Dermatology Hospital Nguyen Thi Thai said there were 136 patients in the hospital, aged between 50 and 101. Many of them moved to live in the hospital in their 20s. They refused to return to their hometown for fear of discrimination. Thai said apart from leprosy, these patients suffered from diabetes, blood pressure, eye disease and other neurological illnesses meaning treatment was very difficult. After merging with Thai Binh Dermatology Hospital last year, the hospital has changed dramatically. The life of leprosy patients, including nutrition regimes and examination and treatment activities, has improved. Thai said she hoped the hospital would get financial support to provide a better service for the patients.